Q. Where can I find full text articles from the Wall Street Journal? In which database is the Wall Street Journal? The Wall Street Journal can be accessed from the A-Z Databases list on the library website. 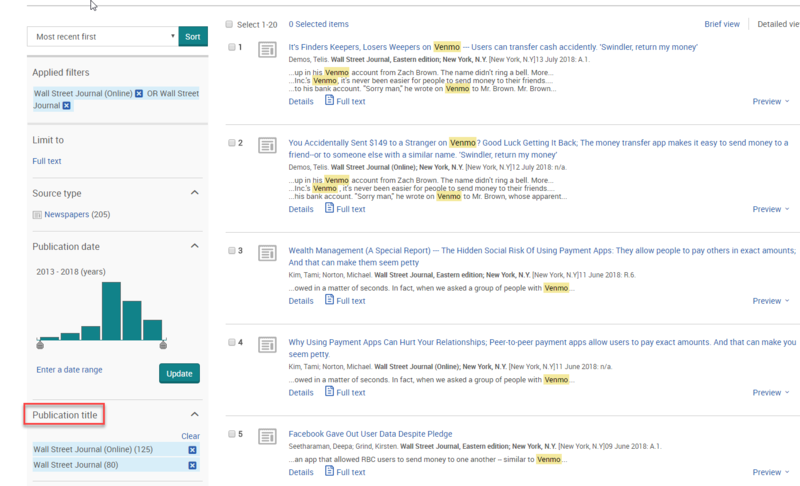 Full text articles are found in the ProQuest database. Once on the A-Z list of databases, click on "W" and select “Wall Street Journal”. When the new window opens, you can type your search terms into “Search Within this Publication” box, or browse for a specific issue by date at the bottom of the page. Then click on the blue A-Z Databases icon, and follow the directions above. It is also possible to limit to articles from the Wall Street Journal directly from ProQuest Central search results. Click on the letter P to find "ProQuest Central". Once you are on the ProQuest search page, type in your search terms. After the results load, scroll through the "Limit by" area toward the bottom left, until you get to "Publication title". Then click the dropdown arrow next to it, and "More Options"; find Wall Street Journal and check the "Include" box next to it, then "Apply"
If you're not seeing WSJ, click on the blue "Publication Title" at the top of the list, so it will re-sort them into alphabetical order. You will now only have results from that publication.